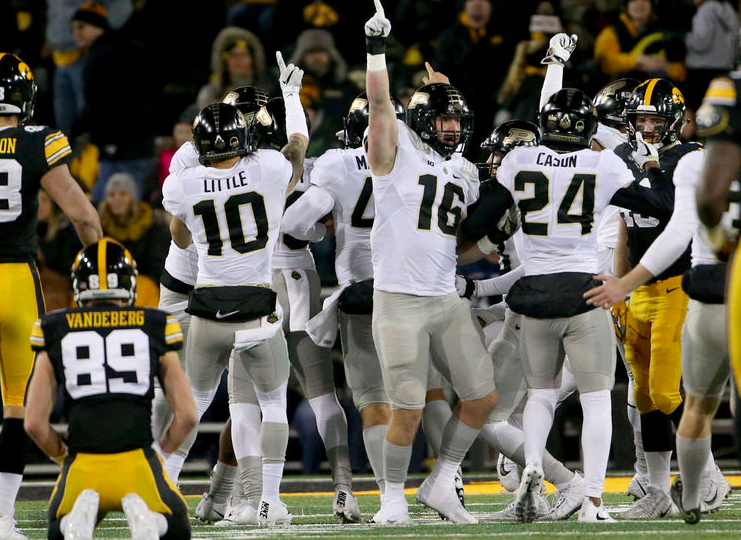 IOWA CITY – Playing one of the 10 hardest schedules in all of college football would wear on most teams. It’s a grind, week in and week out. Lots of teams aren’t built for it, especially young teams with still-developing stars. Iowa showed us first hand how hard football can be. 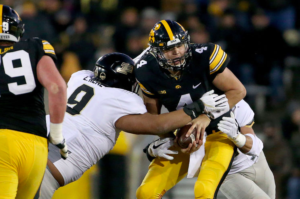 The Hawkeyes looked lethargic for the second straight week as they dropped their home finale to the Purdue Boilermakers 24-15. Mistakes cost the Hawkeyes big time in this one. On the first Purdue possession, Iowa forced the Boilermakers to punt from their own 40-yard line, but Amani Jones and Nick Niemann met in the backfield, resulting in a roughing the kicker call. Purdue maintained possession and later scored on a D.J. Knox five-yard touchdown reception. The roughing call was the first of six penalties called on the Hawkeyes. Most penalties were costly, including a couple false starts that stalled drives. In the second quarter, a pooch punt from Stanley pinned the Boilermakers inside their own three, and senior Nathan Bazata recorded a sack-safety on Purdue quarterback Elijah Sindelar. Iowa trailed 7-2 at the time, and it marked the third straight game in which the Iowa defense scored before the offense. Purdue kicked off from the 20 and the ball bounced out of bounds near the Iowa 30. By rule, the ball was placed 30 yards from the point of the kick at the 50. The Hawkeyes took advantage of the field position and marched on a nine-play scoring drive. Stanley found Matt VandeBerg on fourth and five for a gain of 18 that set up a two-yard touchdown run for Akrum Wadley. At the half, Iowa led 9-7, even though the offense had not looked great. 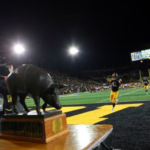 The Hawkeyes elected to receive the game’s opening kickoff and go into the wind in the first and third quarters, allowing them to get the wind to finish the game. This gave Purdue the wind to start they third quarter. The Boilermakers found a matchup they liked and exploited it. Manny Rugamaba lined up against Purdue senior wide receiver Anthony Mahoungou most of the first half, and Purdue was adamant on not throwing the ball towards Josh Jackson. Instead, Sindelar targeted Mahoungou three straight plays. Rugamba allowed an 11-yard catch, was flagged for pass interference, and then was beat deep for a 42-yard touchdown pass. Purdue led 14-9. After the Iowa offense went three and out, Colten Rastetter’s short punt set Purdue up at the 50. Sindelar stayed away from Jackson and targeted Mahoungu again. Michael Ojemudia lined up on Mahoungou to start the drive, but again, Mahoungou had the upper hand and beat Ojemudia for a 35-yard gain. Looking for answers, defensive coordinator Phil Parker sent Matt Hankins out to cover Mahoungou. Two plays later, Sindelar connected with Mahoungou for a 16-yard touchdown pass. In just over three minutes of game clock, the Boilermakers had taken full advantage of one matchup. In a flash, they led 21-9. After the series, Jackson was sent to the right cornerback position to guard Mahoungou, but the damage was done. The Hawkeyes would struggle on offense and not muster anything in the third quarter. The offense did not score until Stanley hit Noah Fant for a six-yard touchdown completion with less than four minutes remaining in the game. Iowa trailed 24-15 and failed to covert the two-point try. Purdue recovered the on-side kick attempt and ran out the clock to secure the victory. The offense has gone completely missing since the 55-point output against Ohio State. 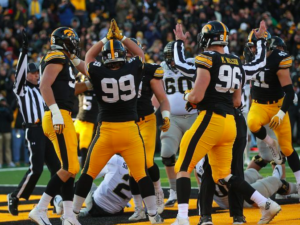 Frustration was felt inside Kinnick Stadium on Saturday. Fans booed on a few occasions, and even let out some sarcastic cheers after first downs. You’ve probably never seen so few fans at a game in Kinnick. Most fans were gone before the midway point of the fourth quarter. The Boilermakers’ defense is better this year than it has been in years past. They gave Stanley and the Iowa offense trouble from start to finish. 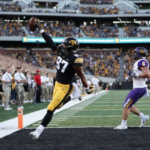 After the offense gained just 66 yards of total offense last weekend at Wisconsin, the Hawkeyes offense did a little better this week – it’d be hard to do worse – but still looked discombobulated. The Hawkeyes totaled just 14 points on offense and finished with 258 total yards of offense. It has seemed for the past two weeks that energy was lacking from the Iowa sideline. Players and coaches couldn’t pin it down though. The team showed no signs on dropping off in practice either of the past two weeks. It’s also impossible to blame just one position group for the loss. On offense, four different receivers recorded a drop, failing to take advantage of the few opportunities they had for yardage. Special teams was as frustrating as ever, and it merely started with the early penalty from Jones and Niemann. Rastetter averaged just 29.7 yards on his six punts, albeit, most were into the wind. Regardless, the rugby-style punts couldn’t get much carry. On the return end, VandeBerg misplayed a couple of punts again today, including a fourth quarter punt that he made a diving attempt on. He couldn’t hold on, and it set up a field goal for the Boilermakers after they recovered it. “I thought I could field it cleanly, and obviously I was wrong,” VandeBerg said. The offensive line has also seen better days. Stanley was sacked six times for a loss of 44 yards. Failing to recognize the blitz packages – of which, Purdue has many – led to the demise. In all, it was just a rough day at the office, and a difficult way to say goodbye to so many impactful seniors. 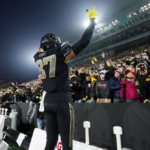 With just one more game on the schedule, a Black Friday matchup with Nebraska, the Hawkeyes say they’re ready to turn their attention to the Cornhuskers in the short week. Iowa (7-5, 3-5) and Nebraska (4-7, 3-5) will kick off on Black Friday at 3:00pm CST on Fox Sports 1.